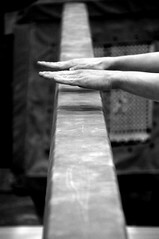 You are here: Home » Blog » Gymnastics » What are you passionate about? For sixteen years, I’ve taken part in the great sport of gymnastics. I trained as a gymnast for eleven years and I am now in my fifth year of coaching professionally. Everyone has their reasons for feeling passionate about something in their lives. I’d like to introduce you to mine. My coaches taught me about my body – what was the correct way to stand and why. Standing up tall with my “bum tucked and belly sucked in” somehow gave me an air of confidence. I learnt that I could make my body stronger and developed an understanding of why I needed to. I discovered that I could make my body go from being sloppy and loose to strong and hard. A strong interest in the biomechanics of the human body from an early age also encouraged this! There’s nothing like the feeling of achieving a new move, of winning a medal at a competition, whether it be individually or as part of a team. Many kids are put into sports and activities that they really aren’t suited to but for me, this was never the case. Gymnastics has always been my sport, I’ve always felt a part of it. Knowing I belonged made it that bit more special and enjoyable to me. Even when outside of the gym, I was always cart wheeling and back flipping on the road outside. I even had my own show at my primary school. In the summer, we were allowed to spend lunch time in “the field”. Myself and 2 of the older girls from the club would practice our back flips and somersaults, while all the other children and teachers watched in awe. It made me feel really special that people wanted to clap and cheer for me. When I’m in the gym, I can block out all other thoughts. When I focus, nothing else enters my head. So much concentration is required when training on all of the pieces, and even as a coach, watching every line of your gymnast’s body to try and spot the tiniest mistakes. My mind has to be clear, other worries will affect my training too much. The outside world must fade to insignificance. Even now, I still get so excited at the prospect of buying new equipment. Recently our club made a huge purchase, almost doubling our current amount of equipment. This is a big achievement for the club. The amount of equipment a club requires to progress in the sport is vital but with it costing so much, it can be hard to regularly add to your stock. I began this blog to write about one of my biggest passions in life. I hope that other gymnasts, coaches and maybe even outsiders will find this interesting.. I will mostly write about gymnastics, sports injuries and other sporting interests. Along the way, I may also write about other topics that I enjoy. Please feel free to leave comments and of course to subscribe using the button below the moon image. Welcome to part of my world! Full Twist » Happy Birthday!